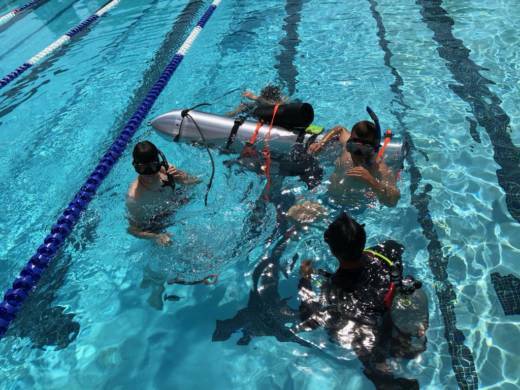 A mini-submarine designed by SpaceX engineers arrived in Thailand on Monday to assist with the rescue of four boys and their soccer coach, according to a series of tweets by SpaceX CEO Elon Musk. The "kid size" submarine, named Wild Boar after the children's soccer team, was designed in one day and is made of rocket parts. It is light enough to be carried by 2 divers and small enough to get through narrow gaps, Musk tweeted. A dive team has successfully rescued eight of the original 12 boys trapped in northern Thailand's Tham Luang Nang Non cave. The only way to reach them was by navigating dark and tight passageways filled with muddy water and strong currents, as well as oxygen-depleted air. The SpaceX submarine was tested over the weekend at Palisades Charter High School in Southern California. Musk tweeted out several videos of the test. Last week, Musk announced that he was sending engineers from his companies to aide with the rescue operation. The boys, ages 11-16, and their 25-year-old coach have been trapped in the cave for two weeks, when they went exploring in northern Thailand's Tham Luang Nang Non cave after a practice game. Monsoon flooding cut off their escape and prevented rescuers from finding them for almost 10 days. The mini-submarine, which uses a component from Spacex's Falcon 9 rocket, could also be used one day for space rescue missions. “With some mods, this could also work as an escape pod in space,” Musk tweeted.